FRONTIER SERIES — The Shop Industrial inc. The Frontier 600 6x6 amphibious XTV is powered by a 4 cycle OHV V-Twin gasoline EFI engine. It’s an electronic ignition, air cooled 570cc, 18 hp Briggs & Stratton engine. It has a load capacity of up to 640 lb. on land or 440 lb. on water, can transport 2 passengers on land, 2 on water and features a towing capacity of 1,200 lb. Rear seat weight restrictions of 140 lb. applies. The Frontier 700 6x6 amphibious XTV is powered by a 4 cycle OHV V-Twin gasoline EFI engine. It’s an electronic ignition, air cooled 747cc, 23 hp Kohler Command Pro engine. It has a load capacity of up to 560 lb. on land or 360 lb. on water, can transport 2 passengers on land, 2 on water and features a towing capacity of 1,200 lb. Rear seat weight restrictions of 140 lb. applies. The Frontier 700 Scout 6x6 amphibious XTV is powered by a 4 cycle OHV V-Twin gasoline EFI engine. It’s an electronic ignition, air cooled 747cc, 23 hp Kohler Command Pro engine. It has a load capacity of up to 630 lb. on land or 430 lb. on water, can transport 4 passengers on land, 2 on water and features a towing capacity of 1,200 lb. Rear seat weight restrictions of 140 lb. applies. The Frontier 650 8x8 amphibious XTV is powered by a 4 cycle OHV V-Twin gasoline EFI engine. It’s an electronic ignition, air cooled 570cc, 23 hp Briggs & Stratton engine. It has a load capacity of up to 910 lb. on land or 810 lb. on water, can transport 6 passengers on land, 4 on water and features a towing capacity of 1,400 lb. 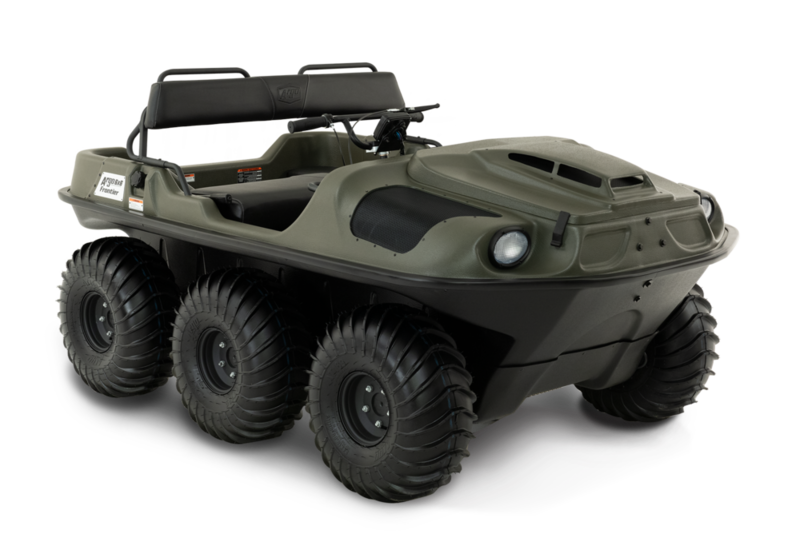 The Frontier 700 8x8 amphibious XTV is powered by a 4 cycle OHV V-Twin gasoline EFI engine. It’s an electronic ignition, air cooled 747cc, 23 hp Kohler Command Pro engine. It has a load capacity of up to 830 lb. on land or 730 lb. on water, can transport 4 passengers on land, 4 on water and features a towing capacity of 1,400 lb. The Frontier 750 8x8 Scout amphibious XTV is powered by a 4 cycle OHV V-Twin gasoline EFI engine. It’s an electronic ignition, air cooled 747cc, 26 hp Kohler Command Pro engine. It has a load capacity of up to 830 lb. on land or 730 lb. on water, can transport 4 passengers on land, 4 on water and features a towing capacity of 1,400 lb.